Aircraft cylinders can be efficiently rebuilt and reused if properly inspected, properly machined and the necessary parts are replaced to provide for extended service life. One of the most common problems effecting aircraft cylinders is surface corrosion. Corrosion erodes the cylinder barrel wall and causes premature cylinder barrel and piston ring wear. This can cause high oil consumption, reduced power, higher oil analysis metal readings and engine breather blow by. When this situation occurs you can either replace the cylinders or rebuild them to extend their service life. Due to the high cost of aircraft cylinders, rebuilding the cylinders may be a better option in many cases. To rebuild a cylinder assembly that has had cylinder barrel wear or corrosion the steel barrel can be re-machined to restore it to factory new limits for piston to barrel dimensions. In order to accomplish this the cylinder barrel will be first measured and NDT tested to determine if there is enough material left in the cylinder barrel to allow for re-machining. 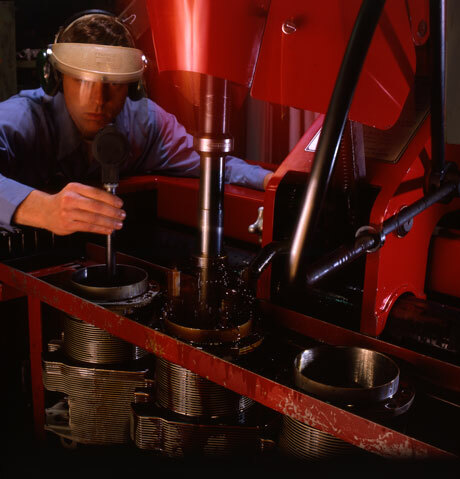 Re-machining of the cylinder barrels is controlled using a “Power-By-Victor” precision honing machine that will provide for the proper taper and finish size of the barrel for optimum engine performance. Machining the cylinder barrel for proper taper or “choke” is critical for efficient engine performance and lifetime of aircraft cylinders. 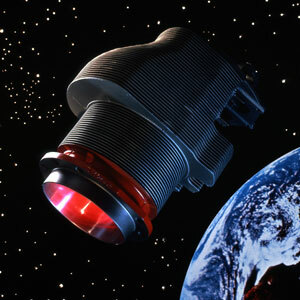 As an aircraft cylinder expands under normal operation the upper portion of the cylinder barrel will expand greater than the lower portion of the barrel. When this occurs, loss of engine power, excessive oil consumption and blow by can occur even on a new cylinder. To correct for this anticipated and known expansion, Victor Aviation can re-machine the cylinder with a taper that will offset for the expected expansion of the barrel allowing for parallel bore dimensions when the cylinder is operated at temperature. 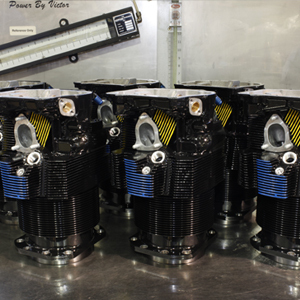 With over 36 years of aircraft cylinder and engine overhaul experience, “Power-By-Victor” technicians know the exact dimensions necessary to machine the proper cylinder taper dimensions for your particular engine application. Production manufactured new cylinders are mass produced and designed to apply to a wide range of engine applications. These new cylinders can also be enhanced greatly with Victor Aviation’s special re-machining techniques for longer cylinder life and optimum cylinder performance by designing the particular taper into the cylinder barrel for your engine application. To allow for best engine performance the intake valves, exhaust valves and seats are precision ground, hand lapped and seated to “Power-By-Victor” specifications. 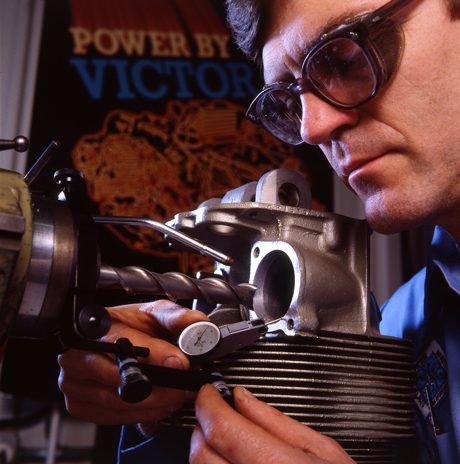 These procedures used by Victor technicians are one of Victor’s fine attentions to detail that greatly determine a cylinders performance. Due to cost cutting techniques used by most new cylinder manufacturers today these practices which used to be provided many years ago on new cylinders have gone forgotten. Cylinder air-flow matching and balancing services are also available. 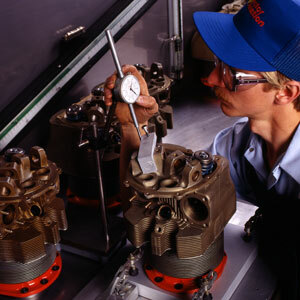 These techniques were pioneered by Victor Aviation many years ago for the aircraft industry with specially designed equipment to perform these services. Cylinders are available in matched sets for either “Power-By Victor” rebuilt or factory new cylinder assemblies for Lycoming and Continental Motors engines.